Let me start by saying that I thoroughly enjoyed reading this Fundraising eBook. I found 'Let's Raise Money' informative, intuitive and with content that held a lot of really great advice that would make any fundraiser more profitable! All in all this is a book that is definitely a worthwhile read, and one that will certainly help make your fundraisers more rewarding and profitable! To order 'Let's Raise Money' click here. If you have read 'Let's Raise Money' then please feel free to add your own review or thoughts at the bottom of the page. Who Is This Fundraising Ebook For? From churches, schools, PTA associations, youth groups, sports teams, small charities, foundations, and even individuals. It will not, however, be as beneficial to huge charities and foundations that have to solicit hundreds of thousands of dollars a year from donors and companies. "This book is not written for the university development director that has the responsibility to shake a few million dollars out of the alumni association this year. "Rather, it is written for the person who has a desire to help an organization like a band, or choir or school club or church youth group or little league raise money they need for various projects." Please also note that although this book is written by an American and with American's in mind, it is a book that will be useful for anyone, from anywhere in the world, wishing to fundraise. Throughout the book you will find superb tips, techniques and advice that if used properly, will make your fundraisers better and more efficient! 'Teaching Your Sellers To Sell'! But the success of that fundraiser will totally depend on how well you are able to sell that product! The better you and your sales team can sell, the more profitable your fundraiser will be. So knowing how to sell and being able to teach your sellers how to sell is extremely important. Jack Atwell gives superb advice on how to sell and how to teach your sales team, how to sell. His simple methods and advice on preparing your sales members will really make a difference to your fundraising campaigns. I will in fact go so far as to say that even if this was the only section in the Fundraising eBook it would still be worthwhile the cost... simply because your 'return on investment' would be so good. The cost of this fundraising eBook is currently $19.97, but the increase in profits that you will get from just reading and utilizing the advice in this section will be far greater than the cost of the actual book. So therefore your 'return on investment' will be excellent and worthwhile! The 'Accountability For Money' Section! This part of the book is something that I think most people don't think about enough. Jack talks about setting up good policies to prevent anyone in your group from 'borrowing' money they can't pay back, or even stealing! He essentially says that by setting good money handling policies you will be protecting your organization, your treasurer (or the person/s handling the money), and all involved from embarrassment and controversy. It's a section you should definitely pay attention to. This is of course a very important part of any fundraising eBook... And you won't be disappointed with this one, as you will find loads of really innovative fundraising ideas that could be used by any nonprofit or individual. Jack points out that obviously not every idea will work for everyone. He advises on which ideas to be cautious with and what ideas will only work for certain groups. The ideas are accompanied by good advice and also warnings and things to look out for. All in all this is another great aspect of the book. Sales Incentives - I am always going on about how important sales incentives are to help motivate your sales team, and this book backs me up. Jack also gives some great ideas for sales incentives that won't necessarily cost you money! Safety Precautions - We all know how important safety is, especially when it comes to kids. There are certain safety precautions you need to take when fundraising and Jack highlights on these. Publicity - Raising as much awareness about your fundraiser is really important! 'Let's Raise Money' has some great ideas for advertising and raising publicity! This aspect of the book is not necessarily bad, but it's just something I'm unsure of. Throughout the fundraising ideas in the book Jack recommends different fundraising companies to use. I simply don't know any of these companies and am therefore unsure of whether they are good recommendations or not! Personally I recommend GA Fundraising as the company to use for all your fundraising products. They have an excellent customer care record, have been around a long time, are stable, and they are lastly helping many nonprofits successfully fundraise. For more information grab the FREE info kit. When it comes to the company recommendations in 'Let's Raise Money' I'm afraid you're going to have to make your own mind up about them. I would suggest though, that if you can, rather just stick to Fast Track Fundraising. So Is This Fundraiser EBook Worthwhile Buying? My simple answer is... YES! The content of this fundraising eBook is excellent, the advice and techniques are great, and the fundraising ideas are innovative, profitable and successful. 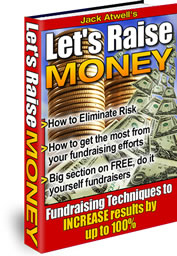 It is a book that will definitely help you run a far better fundraising campaign! But most importantly your 'return on investment' will be excellent! For a measly $19.97 you will invest in information, advice, techniques and ideas that, when used, will return you far greater amounts of funds raised than your initial investment! I hope that this fundraising eBook review has been of benefit to you, and that the eBook will help you with your fundraising campaign... Of which I’m pretty sure it will! For more information and to order this fundraising eBook, click here. Please Note: $19.97 is the current price of this fundraising eBook, but the author may change this price at any time. If the price has changed, I would appreciate it if you would be able to notify me about that change, so I can obviously change this page accordingly. What Are Your Thoughts On This eBook? If you have read, or are planning to read, 'Let's Raise Money' please feel free to leave your own opinions or reviews about the book. Fill in the form below and let us all know what you thoughts are about this eBook.